Suggestions for a 5W Vox-style amp? Discussion in 'Amps and Cabs' started by noetic, Aug 23, 2008. Basically, I'm looking for a simple, well-built amp that's got a bit of that Beatles vibe. Any of you know something that fits the bill? Try a Dr Z Mini Z. 5 watts, built in attenuator. $500 on ebay or the like. Great tone. 2 knobs. Volume only. Cant get much simpler than that. I got one. Its great. I even use it in church. All Tube. el84 and a 12ax7 preamp. no ef86 though. Try a Dr Z Mini Z. Thanks for the suggest, mango. I'm familiar with the Mini Z--great amp...but I really want an ef86 pre. I thought the Z was more Marshall than Vox. Bad Cat Mini fits except no ef86. Is this a combo ? What size speaker in a Dr. Z mini Z ???? Head or combo versions available with great master. gary said it needed to have ef86. I know I have seen incarnations of the Fargen Bastage with an ef86 (though it uses an EL34) 4 watts though. The Mini Z combo with 8" speaker is no longer in production. Head only. Yeah, it's more of a high-gainer, not the tone I'm looking for...still a cool amp. So there's no amp out there that matches my specs? How about a Vox AC15 hand wired Heritage Series. The head costs $999 and is switchable between 15 and 7.5 watts. Plus, it has the EF86 tube. Top Hat Prince Royale.... EF86 and EL84. It's based on the old AC4 I believe. Has volume, boost and bright switch. It can get some good Vox chime with the bright switch on. I just got a Weber Blue Pup to put in mine but haven't tried it out yet. Meets all your requirements I think. You'd have to find one used as their discontinued. Yes! Prince Royale is the one. Why-oh-why did they stop making 'em? I have actually looked hard for a used one...no luck. Nobody wants to give theirs up. Surely, there is something else out there like it. No? Thank you all for the helpful suggestions. Keep them coming! I may end up going that route...have to give it a good test drive. Ironically, I'm reluctant to buy an actual Vox-branded product. In my experience, boutique clones offer higher quality at lower costs than corporate reissues. I have a Tele, a Strat, a Les Paul, and a 335--all clones, all handmade in the US from respected and established manufacturers (G&L and Heritage), all costing fractions of the prices of their respective Fender or Gibson-branded equivalents. On the other hand, the AC15 Heritage seems pretty affordable for what it is--which makes me skeptical of build quality and reliability. Just an ignorant stereotype. If any of you have experience with this amp and feel my assumptions are offbase, please let me know. I wouldn't mind being wrong here. How about putting a Voxy board from turretboards.com in a used Valve Jr.? Not sure if it matches the voxy-ness and I think it uses a different preamp, but there is one of the original Goodsell 5 watts (only 14 made) for sale at Atlanta Discount Music. I love mine. It meets your other specs. 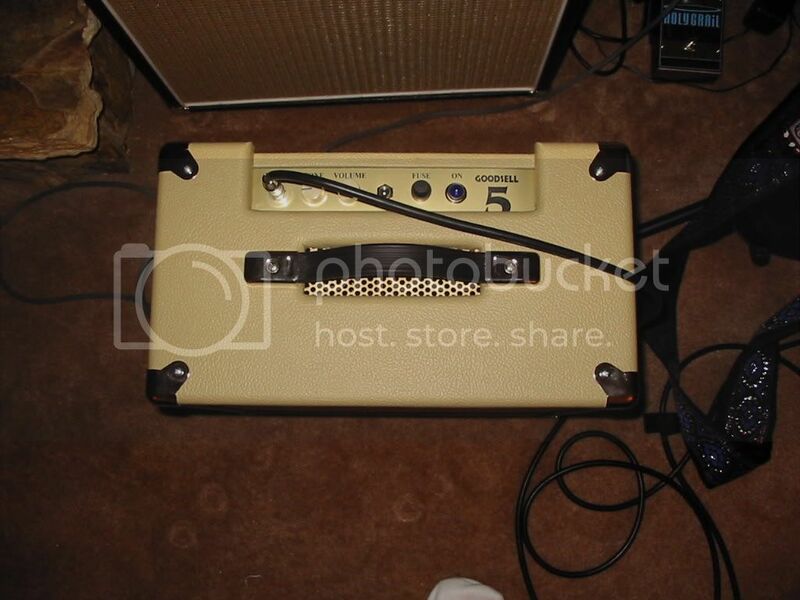 I also have owned the first incarnation of the Fargen Bastage (ef86, EL84, internal attenuation) - great 4 watt amp. More than loud enough for home practice/studio use. But the Cyclone will give you a great MV and the ability to get much louder if you need it to. Caution, for ef86 based amps I would ALWAYS go with a head/cab. Combo's have too much rattle and are prone to microphonics. So...since Top Hat discontinued the Prince Royale, my dream amp doesn't exist? Will I have to commission one then (because I sure as hell can't build it)? Please, somebody say it ain't so! Call and talk to brian at topHat he might surprise you. Someone must doe a AC5 maybe JMI? Keep checking eBay... they pop up every now and then. That's where I got mine about a year and a half back. It was brand new from a shop buyout or something... low serial number.